Queen Anne additions on what seems to be Federal-Greek basic form. 3 dormers on roof; brick porch/rounded and pillared; side entrance; long window meets over rounded front; columned and pilastered porch. Themes - Architectural, Community Development and Education. Rev. John Lord Taylor Original owner. Jacob Chickering worked on this house. Bill at MVTM lists: "7 windows in shed, 2 garret windows, 3 long windows front, 2 short windows front in chambers, 2 door frames, stairs front entry piazza - $185 stone and brick work. Plastering Maine house, two stories". Rev. John Lord Taylor, D.D., built the house when he was pastor of South Parish Church from 1839 - 1852. John Lord Taylor was born on May 20, 1811 in Warren, Litchfield, CT, son of John Lane & Anna (Beardsley) Taylor. Rev. Taylor was a graduate of Yale College 1835, Pres. of thier Linonian Society, C.A.S., Tut. John married in Aug. 1838 to Caroline L. Phelps, b. Mar. 12, 1816 at Warehouse Point, Hartford, CT, daughter of Col. Epahhras Lord Phelps & Elizabeth (Holkins) Phelps. The Taylors had five children of which two reached adulthood; John Phelps b. Apr. 6, 1841, Henry Bethuel b. Feb. 1843 d. Dec. 1846, Maria Phelps b. Nov. 1, 1845 d. Dec. 14, 1845, Edward Johnson b. Dec. 30, 1847 d. Apr. 12, 1850 and Frederick Holkins b. July 31, 1851 d. Nov. 29, 1872. John L. Taylor Willed the property to Andover Seminary with request that if his son, John Phelps Taylor, came to Andover to live he could occupy the home free from rent. Caroline Phelps Taylor died on Apr. 3, 1868 in Andover and Rev. John died on Oct. 14, 1868 in New Haven, CT.
Rev. John Phelps Taylor came to Andover 1863 to teach Biblical Theology and History at the Andover Theological Seminary. John P. graduated from Yale College in 1862 then the Andover Theological Seminary in 1868. Both John L. & John P. Taylor were Abbot Academy Trustees. John married Antoinette Hall b. 1835 in New Haven, Ct, daughter of Nathan Fern & Grace Emily Hall. John & Antoinette left no issue. Rev. John P. was ordained pastor of the South Church in Middleton, CT in 1868. He later had a pastorate in New London, CT in 1880. Rev. John P. Taylor returned to Andover (Andover Directory 1899). He was also a minister of the Seminary Chapel. In the 1910 Census Rev. John P., wife Antoinette, and two domestic servants are listed at this address. John P. Taylor died on Sept. 13, 1915 in Andover. Antoinette died June 5, 1923. They were interred at Evergreen Cemetery in New Haven Ct. The property was transferred to Abbot Academy in 1913 from Phillips Academy. "The building reverted to Abbot control following the death of Mrs. Taylor in 1923. 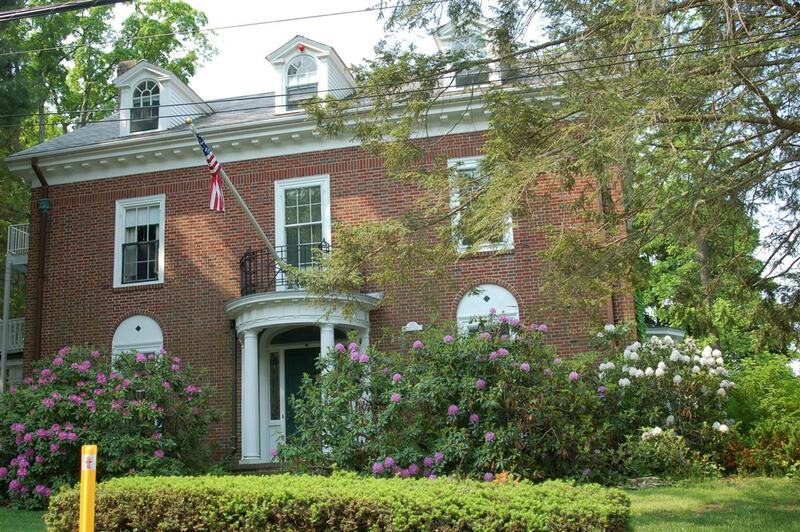 In 1926 it became the home og Mr. & Mrs. Burton S. Flagg, Treasurer of Abbot Academy for many years." In 1933 he (Flagg) turned over to the school the lounge and kitchenette above his garage where his daughters had entertained her friends. The Abbot teachers could gather there, relax and smoke - it was the only place the Miss Bailey allowed the staff to smoke." 1962 - Mr. and Mrs. Burton S. Flagg, Treasurer of Abbot Academy, occupied the home for over 35 years. "Jubilee Meeting of Class 1858 at Phillips Academy - held June 17, 1908 on Andover Hill at Commencement dinner and at home of Professor Taylor, Class Valedictorian. ", 1908.